I wanted to share with you three songs sang at the US-Philippines Diaspora Partnership workshop last January 22, 2011 at Adamson University, Manila, Philippines. This was also my first time to take part in a workshop where I was serenaded by music. Enjoy! 1. The first song titled ‘Pagbabalik’ (Coming Home) is also the main theme of the workshop. 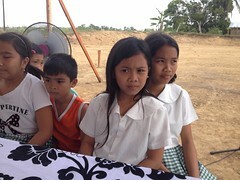 Huzanna DeVera, 12 years old, sang the song during the opening of the workshop. 2. Boojie Juatco sang this second song titled ‘Uha’ (Crying). He also wrote this original song depicting the children allegedly affected by the toxic contamination left behind by the former US military bases in the Philippines. Boojie sang the song at the reception and serenaded the participants. 3. The third and last song titled ‘Dakilang Lahi’ (Pride in Filipino Heritage) was sung by Huzanna DeVera. This song is about being proud of your Filipino heritage and shedding away many Filipinos’ low regard of their cultural traditions due to colonialism. This entry was posted in Diaspora Donors, Philippines and tagged diaspora giving, homeland, songs. Bookmark the permalink.